Ambitious and interdisciplinary, this long-awaited collaboration is a landmark presentation of the writings of contemporary artists. These influential essays, interviews, and critical and theoretical comments provide bold and fertile insights into the construction of visual knowledge. Featuring a wide range of leading and emerging artists since 1945, the collection – while comprehensive and authoritative – offers the reader some eclectic surprises as well. Included here are texts that have become pivotal documents in contemporary art, along with writings that cover unfamiliar ground. Some are newly translated, others have never before been published. Together they address visual literacy, cultural studies, and the theoretical debates regarding modernism and postmodernism. The full panoply of visual media is represented, from painting and sculpture to environments, installations, performance, conceptual art, video, photography, and virtual reality. Thematic concerns range from figuration and process to popular culture, art and technology, and politics and the media. Contemporary issues of gender, race, class, and sexuality are also addressed. Kristine Stiles’ general introduction is a succinct overview of artists’ theories in the evolution of contemporary discourse around art. Introductions to each chapter provide synopses of the cultural contexts in which the texts originated and brief biographies of individual artists. The text is augmented by outstanding photographs, many of artists in their studios, and vivid, contemporary art images. Reflecting the editors’ shared belief that artists’ own theories provide unparalleled access to visual knowledge, this book, like its distinguished predecessors, Hershel Chipp’s “Theories of Modern Art” (with Peter Selz and Joshua Taylor) and Joshua Taylor’s “Nineteenth-Century Theories of Art”, will be an invaluable resource for anyone interested in contemporary art. Chapter authored: Yinka Shonibare Interviewed by Anthony Downey. 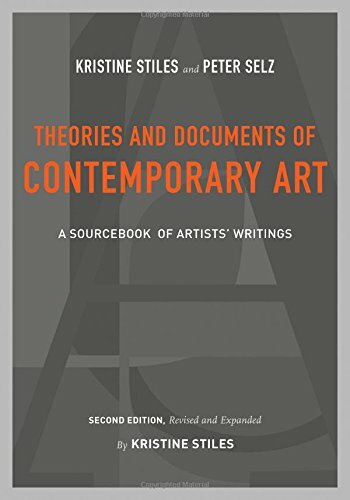 To purchase a copy of Theories and Documents of Contemporary Art: A Sourcebook of Artists’ Writings please follow this link.